This game has been circled on the calendar of all Michigan and Michigan State fans since it was announced, but for different reasons. Since Jim Harbaugh became the head coach of the Wolverines this game has been viewed as the measuring stick of his impact in Ann Arbor. Little did we know that he would be coming off of three straight shutouts. 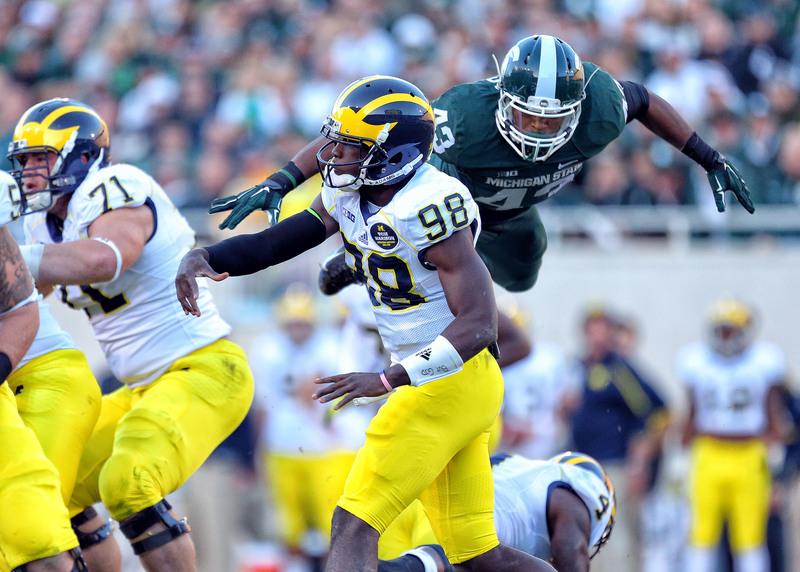 The Spartans have risen from a perennial middle of the pack team to the upper echelon of college football. Mark Dantonio has motivated the Spartans to be part of the discussion for the playoffs over the past two years and now has the ability to drive a stake through the heart of all Michigan fans with a win in the Big House being the underdog. 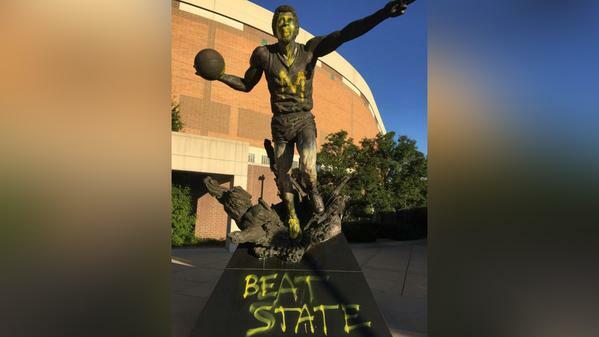 Michigan and Michigan State fans are ,for the most part, petty rivals. They throw jabs at each other like they are in a forced circle of peers and they need to establish their image. There is no true hatred between these schools; there has never been any fights or disrespectful slander thrown at either team. And yes, I know everyone is thinking about Mike Hart’s snide “Little Brother” comment, but that fits right in with the pettiness. 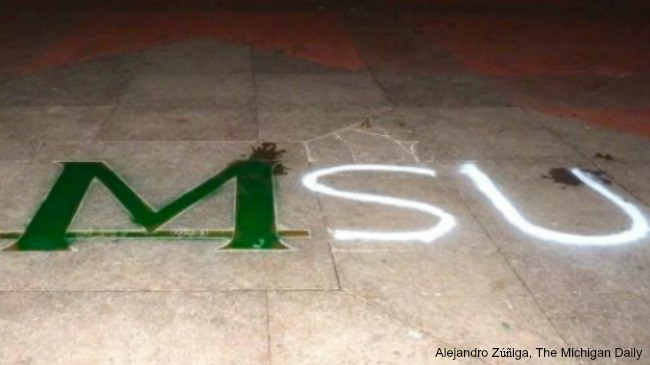 The fans follow suit with the teams they cheer for and their weapons of choice are spray paint cans and social media posts. Both are harmless unless you are the facilities director or PR director of either school. Even though the evidence is quite adolescent it still fits the criteria, because these are colleges and that is your last time you are allowed to do stupid stuff and get away with it and for fans far past the age of college, you have a hall pass on Saturday’s only. Bragging rights is always something to have in your hip pocket whenever those irritating rival fans start running their mouth, but hardware is always better. The ultimate hardware would be a National Championship or even the Big Ten Championship. 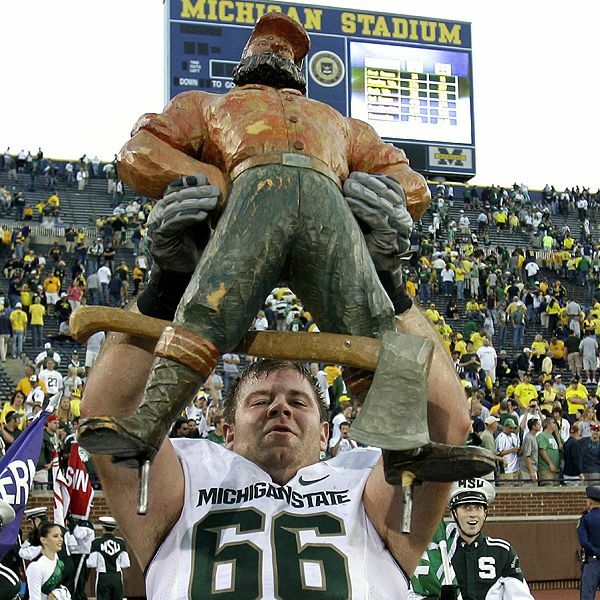 Both of those trophies carry weight, but to the players and the fans the Paul Bunyan trophy is the end all be all. The trophy commemorated Michigan State officially joining the Big Ten in 1953. 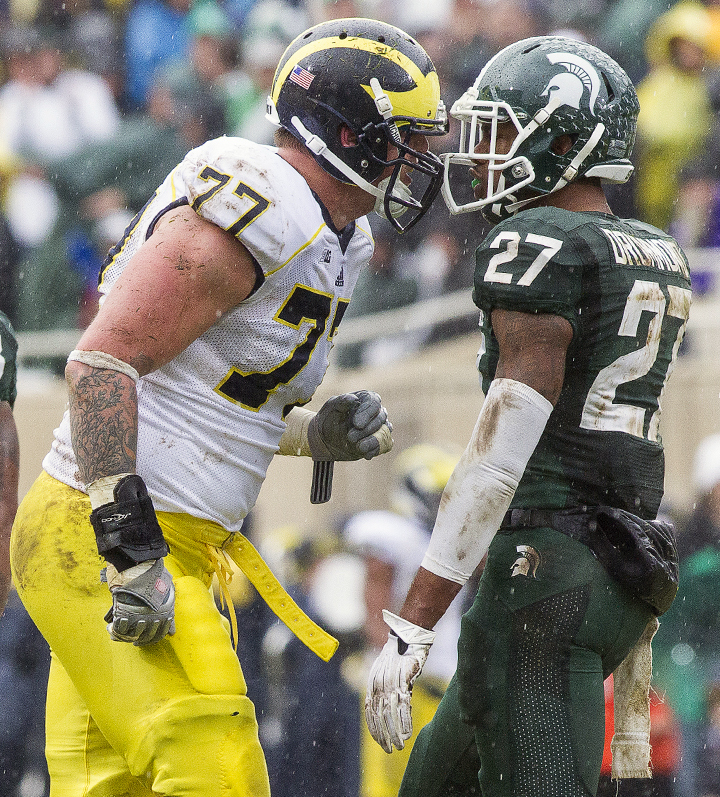 Michigan has the overall advantage 35-25-2 over the Spartans, but it proves that once having something to play for motivated the competitive spirit. Prior to the trophy being on the line the Wolverines dominated the series with a 33-9-3 record. Over the last 20 years the rivalry has become more heavily contested with Michigan with only a slight lead with a record of 11-9. Some teams play to the competition they are against when they don’t respect their opponent, that approach would get a team taken to the woodshed, and has on a couple of occasions. All coaches involved in this series have understood the importance of bringing their “A” game. The overall record in the series doesn’t look like competition was always in play, but the majority of the early lopsided scored occurred prior to MSU joining the Big Ten. So, any Michigan fan throwing out the 119-0 win in 1902 or the 14 straight victories from 1916-29 by the Wolverines is picking low hanging fruit. Michigan State equaled their longest winning streak of four recently, 2008-2011. Players grow up on one side of the fence as fans and players come in and immediately know this rivalry is second to none. With the respect factor at an all-time high you can just about throw the records out when these two go to battle. The storyline for this years matchup begin the moment it was rumored that Jim Harbaugh would be the Wolverines next coach. You best believe even if he wasnt hired as the coach, he would be a part of the storyline of this game. 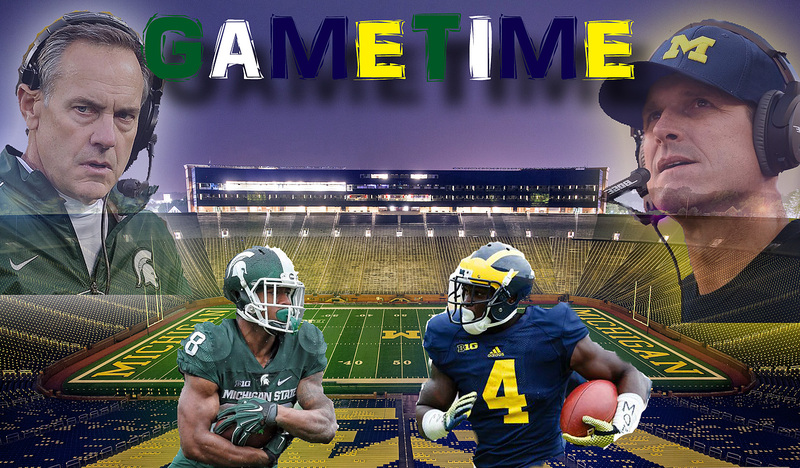 Most excitement building up to the game stems from result from last year; this year the Wolverines have convenient amnesia and the Spartans feel slighted for being overlooked with their recent success and dominance in the series. As a Wolverine fan going into the season, staying close in this game was the goal, after three consecutive shutouts you are more than a touchdown favorite. However fans are eerily calm, which means they are nervous in Ann Arbor. Too cautious to be boastful yet excited about the potential that most thought would come at the earliest, next season. Sparta is quiet and during wartime that usually means bloodshed is coming. Let’s not forget some of the iconic storylines in UM/MSU history: The Desmond Trip, Clockgate and Mike infamous Little Brother. 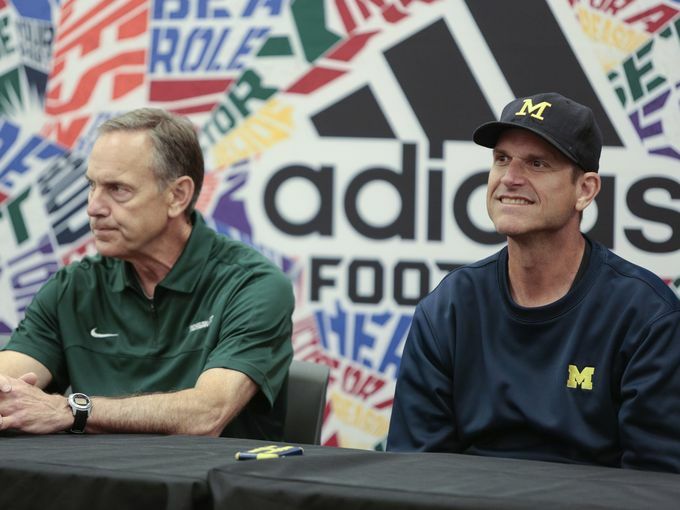 (See video evidence below) The Dantonio/Harbaugh chess match will be almost as fun to watch as the game itself. The slow deliberate fortissimo that will end at kickoff appears to be the exact thing needed for this in-state rivalry between two teams that seem to be trending upward with no decline in sight. So whether you are a Wal-Mart Wolverine, a bandwagon member of Spartan nation or an alumnus of either school, you should be proud of your team and even more excited for the national exposure this game and series will undoubtedly produce in years to come. Go, Blue…Go Green…Go the State Michigan!